North Ridge Mountain Guides founder Jamie Leahy, discovered his love for the mountains on our very own Mt. Washington. Since then Jamie has climbed many peaks in the Northeast as well as the Northwest and even in the Equadorian Andes. Jamie completed the Outdoor Leadership program at Greenfield Community College with a focus on climbing and mountaineering. His passion for the sport of climbing is clear to anyone that has climbed with him. Cotopaxi, Ecuador 19,347ft. Mt. Rainer, Washington 2 ascents 14,411ft. Mt. Shasta, California 5 ascents 14,179ft. Mt. Hood, Oregon 2 ascents 11,149ft. Mt. Washington, New Hampshire 6,288ft. 110+ ascents, 90+ guided. Mt. Pichincha, Ecuador 15,692ft. 2 ascents (one guiding), Cayambe, Ecuador 18,999ft 3 ascents (2 guiding), Guided Imbabura Ecuador 15,190ft, Guided Fuya Fuya Ecuador 13,986ft., Guided Ishinca, Peru 18,147ft., Guided Urus Este, Peru 17,782ft., Guided Yanapaccha, Peru 17,913ft.. Technical ice to WI5 and rock climbs to 5.10 throughout the northeast. "On July 4, 2011, I stood on the summit of Mt. Rainier, my two best friends next to me. At age 25, I had been hiking and climbing for years in New Hampshire, yet that day I found myself in the dramatic terrain of the Cascades. Rather than hiring a guide for Rainier, we took a prep course, studied Freedom of the Hills and practiced in the Whites. I was hooked. Since then I've lead trips back to the Cascades (Hood, Baker, Silverstar) to Ecuador (Cotopaxi, Chimborazo), Patagonia (Cerro Electrico), and a spent my honeymoon crossing the Alps, culminating in an ascent of the Matterhorn. I joined the AAC in 2010 and actively volunteer at local climbing events. In 2015 I founded The Notch Hostel, a successful business located in the White Mountains that hosts thousands of hikers, climbers, and travelers. 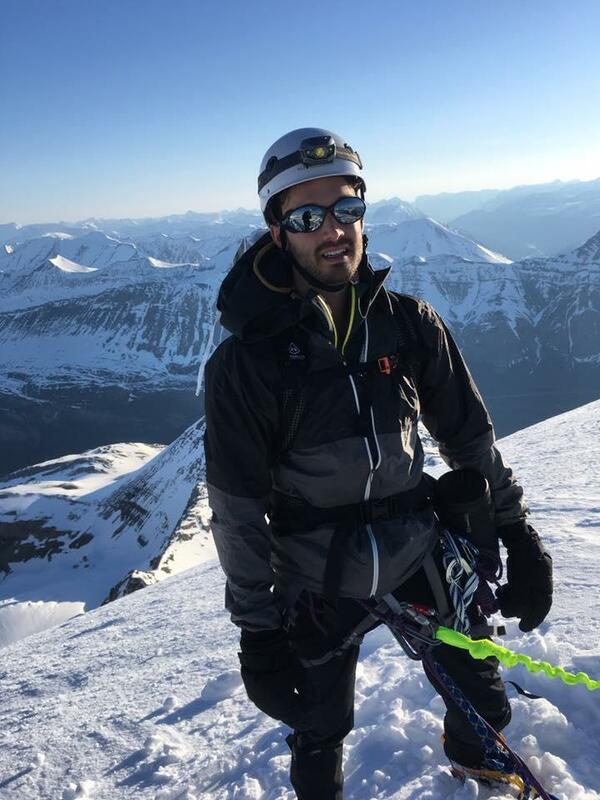 I am extremely passionate about climbing and love helping people achieve their goals in the mountains with North Ridge Mountain Guides." Justin Walsh has been climbing in the White Mountains for close to ten years. Whether it's multi-pitch rock on Cathedral, waterfall ice in Crawford Notch, or a Winter presidential traverse, Justin is at home in these mountains. Beyond the Whites, his passion for climbing has taken him around the world. He's crossed dozens of glaciers from Switzerland to Patagonia and ascended peaks as high as 20,500' (Chimborazo). Sean has been climbing and guiding for over a decade, working as a lead guide for NRMG since 2012. Sean has been teaching climbing at Greenfield Community College's Outdoor Leadership program since 2007, giving the necessary skills to future climbing instructors. Sean is an EMT for American Medical Response since 2005, serving the cities of Springfield and Holyoke MA. He lives and climbs in western MA, but always enjoys climbing in the granite state. Kevin lives a true climbers life, splitting his time between the U.S, Spain, Chili, and Alaska. With onsight sport climbs to 5.12a and ice routes to WI5, Kevin has dedicated his life to guiding and climbing. He is currently spending his season at our future basecamp in Bethlehem NH in an off-grid tiny house and climbing as much as he possibly can. Growing up in Maine, Scott made the New England outdoors his home. He spent much of his time exploring alpine landscapes from the White Mountains to Baxter State Park or solo backpacking in the Adirondacks. In 2016 Scott decided to pursue loftier goals making a move to Eastern Washington. Scott joined the Spokane Mountaineers, enrolling in the Mountain School training program. Since then Scott has climbed in Idaho, Montana, the North Cascades, British Columbia, and Alberta, before moving back East in August. When Scott is not Guiding with NRMG he works as a special education teacher for an adventure-based high school. Scott enjoys taking students backpacking, climbing, surfing, and skiing.